Enjoying a privileged hill-top location, Villa Marigold offers up to twelve lucky guests a vibrant. Enjoying a privileged hill-top location, Villa Marigold offers up to twelve lucky guests a vibrant, luxurious home with exquisite views and a stylish garden in a perfectly calm and quiet residential area. There is a fabulous kitchen, with more than enough space for everyone to chip into meal preparations, and all the modern appliances you're accustomed to, to make your stay as effortless and enjoyable as possible. A large relaxed living area is the perfect place to unwind in the evenings or to enjoy a coffee in the morning. Entire wall-to-wall windows and doors allow you to enjoy the views from anywhere! While is simultaneously inviting in the glorious sunshine and warmth of the outside world, genuinely giving you that holiday feeling. The bedrooms are incredibly stylish. Huge, high-quality beds ensure you have a perfect night's sleep, while ultra-modern ensuite bathrooms, complete with fantastic views, guarantee your comfort at all times. Exposed stone interior walls and a variety of traditional and lively paintings and patterns add a sense of history and a splash of colour to these Scandinavian styled rooms, while a TV in each allows you the chance to spend a little downtime alone if you fancy it. You will love the perfectly furnished rooms, which offer total luxury and provide everything you need for a fun and revitalising holiday! The incredible gardens are every bit as beautiful as the interiors (or maybe even more so!) The highlight is undoubtedly the infinity pool. A massive 5 by 12 metres, it offers space for all kinds of swimming, playing around and calmly cruising along; complete with a row of sun loungers for the final sun-soaked afternoon! The vast terrace offers everything from a large dining area where you can enjoy an alfresco meal, more casual seating areas, a couple of covered sofa areas, with a coffee table for your drinks and snacks and cosy seats to ensure you can relax and take in the fantastic views, warmth and natural environment of this stunning location in total comfort. A lawn area is great for those with kids, providing another space for a little fun and games! The sublime beaches of the west coast of Ibiza are just a stone's throw away, putting the famously beautiful waters of Cala Tarida, Cala Conta, Cala Carbo, Cala Vadella, Cala Moli and many more at your fingertips. The dazzling town of Ibiza itself is 20km away, while the smaller but equally beautiful city of San Jose is only 5km away. And with a supermarket and restaurant within walking distance, you will want for nothing in this lovely home-from-home. Just 3.8km inland from the beautiful coastline of Western Ibiza and the sublime Balearic Sea, Villa Marigold is ideally placed to enjoy all the real highlights of an Ibizan holiday! From water sports to a simple beach day out, the coastline offers so much to enjoy throughout the day, not to mention the world-famous club nights hosted in the beach bars, your most local of which, the Cotton Beach Club, is around a ten-minute drive away! 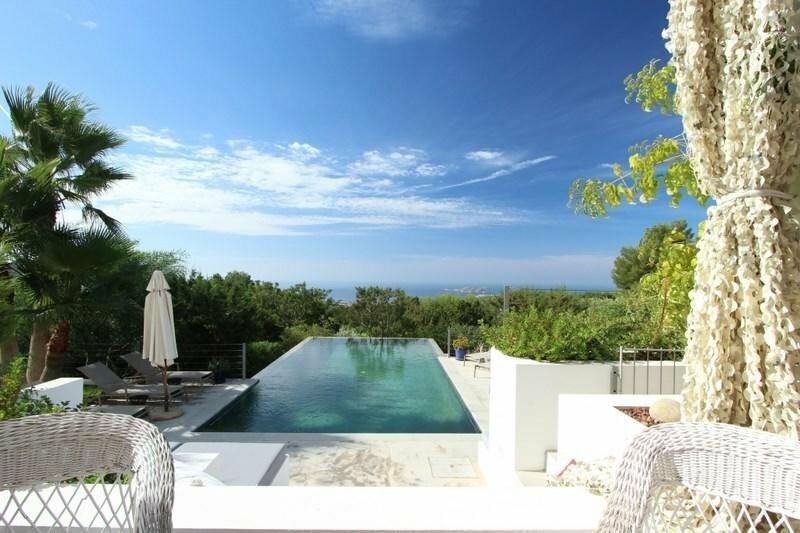 Nestled between San Antonio in the north and Ibiza Town in the south, this villa is perfectly positioned to enjoy both the active, sporting offers and the stylish elegance of the bars, restaurants and retail therapy opportunities of the island!